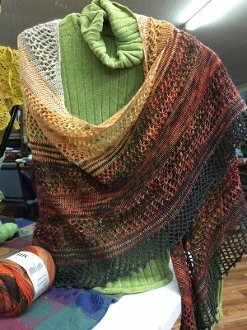 This kit includes the pattern and all yarns to create this gorgeous shawl reminiscent of the tannin stained waters of one of Michigan's great rivers, the Tahquamenon. Tip to tip measures almost 100", this beauty is knit from lace weight yarn but is SUPER EASY!! No stitch markers or extra accessories needed. Yarn is sent pre-wound if needed.